Nothing quite compares to watching a golden sun slip into the horizon amid brushstokes of brilliant colors. Except of course sharing that moment with the one you love. If only you could bottle it. Thanks to the artistry of Murano you can. 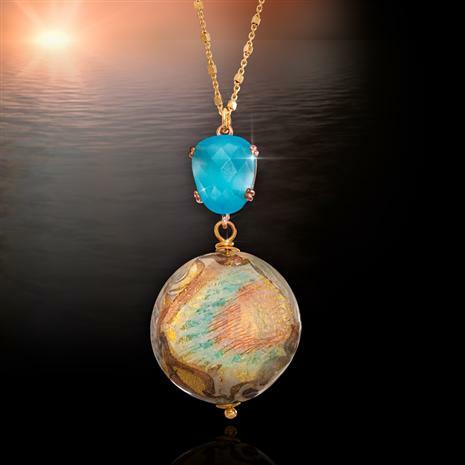 The Tramonto Brillante Collection captures all the romance of a sunset in legendary Murano. The creator of this stunning collection is truly passionate about her craft and it shows. Here, Manuela Zanvettori has transformed glass into art, working solely with original Murano glass canes produced on the island, Manuela forms each piece by hand. Using an age-old technique, fiery suns etched in blue float amid swirling clouds of gold and bronze. For the finishing touch, she tops each piece with beautifully-faceted blue Austrian crystals. She’ll fall in love with you all over again when you surprise her with a piece of this Italian artisan jewelry.